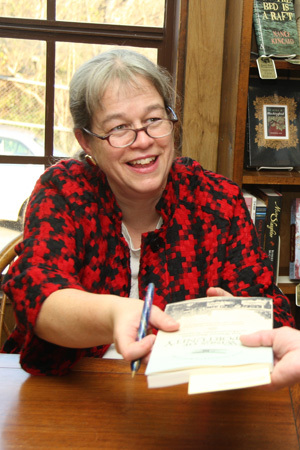 Samford University journalism professor Julie Williams has spoken about her book, A Rare Titanic Family, more than 135 times since the book came out in January of 2012. She has presented programs in 18 states at such venues as the National Archives in Washington, D.C., the Jimmy Carter Presidential Library in Atlanta and at the Titanic Historical Society's commemoration of the 100th anniversary of the ship's sinking in 2012. Now, Williams will tell her dramatic story at Samford in this year's Live at the Library program during Homecoming Weekend. She will speak Saturday, Nov. 16, at 9 a.m. in the University Library. The program is open to the public free. The book is based on the real-life experiences of her great uncle, Albert Caldwell, who with his wife Sylvia and their 10-month old son Alden were one of the few families to survive the sinking of the Titanic intact. Albert carried Alden into the lifeboat after the ship struck an iceberg in the north Atlantic. Williams also delves into the story of the Caldwells, idealistic young Presbyterian missionaries from the Midwest who set out to Bangkok, Siam, on their wedding day in 1909, "eager to serve God and see the world," said Williams. But by 1912 they were ready to return to the U.S., hastened by Sylvia's ill health. Williams heard the story many times from her great uncle before he died at age 91 in 1975. Her extensive research added to the story. Among the artifacts found with Caldwell's effects was a photo of the family on the Titanic deck, which became the cover of Williams' book.